Temperature range from ambient to 48°C with +/-0.2°C. With stainless steel cabinet electrically heated. Used for transportation of gametes and embryos. 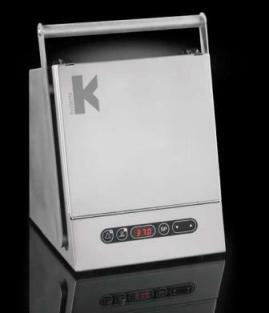 With timer function that enable setting of start heating time. Display shows both temperature and timer. Audible and visual alarms for out of range temperature and mains power failure. Temperature range of 34 – 42°C. Built-in 12V battery to maintain maximum of 3 hours. Also supplied with external adapter and cable are supplied for connections to car lighter socket for warming and transport of aluminum blocks.